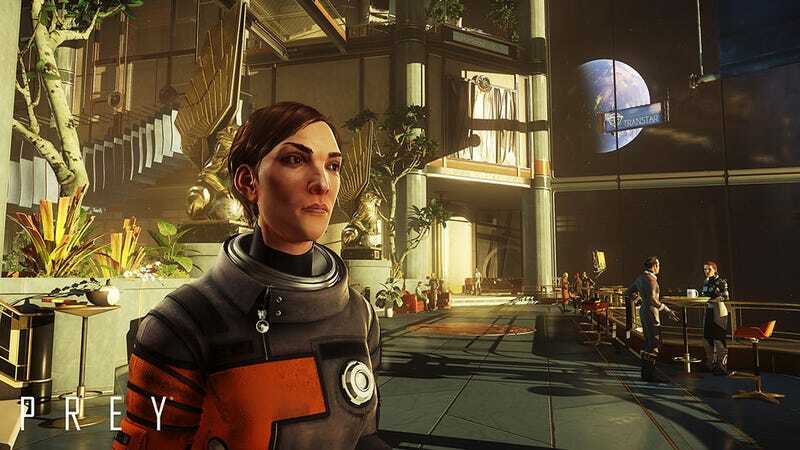 Prey, the newest game from Arkane Studios, is most enjoyable when you take your time exploring its corners and crevices. It’s a quiet, unsettling game, one that can turn into a real drag if you try to rush. So why did Bethesda force reviewers to blaze through the game as quickly as possible? And what kind of lasting damage will this have? This strange, disdainful decision was slammed by critics when Bethesda announced it last fall, but the publisher has maintained its policy nonetheless. This makes Bethesda an anomaly. Traditionally, game publishers will send out review copies to press one to two weeks in advance, often with a “review embargo” of a specific time and date on which critics can post their thoughts. This allows everyone to stay on the same page. A critic at IGN doesn’t have to worry about being scooped by a critic at GameSnacksWeekly because they’ve both agreed to the same embargo. The timeframe may be tight, depending when review copies hit, but nobody has to rush to be first on the web. Yesterday, for example, we received a copy of Fire Emblem Echoes from Nintendo, giving us a solid 11 days to play through the game before it comes out, on May 19. Atlus, god bless them, sent us codes for Persona 5 nearly two months before it launched. Although publishers like Activision haven’t typically offered early reviewer access to online-only games like Destiny, and once in a while a publisher will send out codes late, those are the extraordinary cases. Most publishers are happy to give out early codes for their single-player games, with rare exceptions (like 2K Games). With Prey, as with the last two Bethesda games, the landscape is different. Nobody received the game until May 4, the day before Prey launched. IGN and GameSnacksWeekly would again be on the same page, but here there was no embargo; whoever blazed through the game and wrote his or her review first would get all of that sweet, sweet traffic from algorithm-heavy websites like Google and Facebook that reward speed over quality. Although many reviewers—including IGN’s (and Kotaku’s)—have taken their time with the game in hopes of writing in-depth critiques, others did not. Prey reviews were popping up as early as May 5, despite the lack of early code. Some of these early Prey reviews have been positive; others have been harsh. I’ll leave it to readers to decide which reviews are worth reading, but there’s one outlet that adds a great deal of significance to this dilemma: Metacritic, a website that aggregates reviews and spits out a nice, big number for everyone to look at. As we’ve reported extensively, Metacritic has a huge impact on the video game industry. Game developers’ bonuses are sometimes tied to Metacritic scores, and publishers like to ask for a studio’s previous scores before deciding whether to greenlight a pitch. Often, developers will put their games’ Metascores on résumés and job applications. Despite Metacritic’s many problems—and the arbitrary, meaningless nature of review scores in general—the number still carries weight in the video game industry. As of May 9, Prey has an 80 on Metacritic. Although that number may jump up and down a bit before it settles, it is not considered fantastic. (From what I’ve heard anecdotally, most publishers’ Metacritic bonuses require games to hit an 85 or 90. I don’t know if Prey has any such bonus.) This Metascore is based entirely on the thoughts of critics who have had the game for four or five days. Boggles the mind, doesn’t it? Arkane Austin started developing Prey in May 2013, nearly four years ago. Reviewers have offered thoughts and scores, contributing to the big number that will hang on Arkane for the rest of the studio’s existence, after playing the game for less than a week. Those reviewers cranked through the game under sub-optimal conditions, rushing to beat the clock (and the competition) despite the fact that most Prey players will have far different experiences. I don’t envy anyone who had to review Prey. It’s certainly not pleasant to have to beat a video game and then write up coherent, interesting thoughts under such brutal time constraints. And I certainly don’t begrudge websites for wanting to publish reviews in as timely a fashion as possible, nor would I ever say that one reviewer’s opinion is less valid than another’s. But still… I can’t help but wonder how that Metacritic number would look if Bethesda had given reviewers proper lead time with Prey. I’ve spent the past few days playing this game, soaking in the atmosphere and sneaking around to read e-mails and hunt down side quests. If I had to rush to finish it for a review, I’d be stressing out every time I ran out of ammo or failed to take down one of those damn fire Phantoms. Maybe I’d switch to Easy or try to cheese the game just to finish. I’m enjoying the game far more because I don’t have to worry about those constraints. Bethesda’s failure to give reviewers that same opportunity does a disservice not just to customers who won’t get timely reviews from their favorite critics, but to the developers at Arkane, who spent four years on this game only to watch reviewers stamp numbers on it after just four days. There’s no way to know whether Prey reviewers would have felt differently if they weren’t rushing, but regardless, Bethesda’s policy is a bummer for everyone—even Bethesda.